Calie asks: Why is chickenpox called chickenpox? The name, “Chicken Pox” is vernacular for the Varicella Zoster Virus. While it has a name that evokes cuteness and is even silly, it is a disease that can, though rarely, claim the life of a child. Prior to the May 1995 introduction of the Varicella vaccine, over four million people would suffer from the Chicken Pox every year- approximately 100 would die. The first documentation of the virus is credited to the Italian, Giovanni Filippo (1510-1580) of Palermo. Of course, then, it wasn’t called Chicken Pox. It was named as the “Varicella Virus”. Chicken Pox is a strictly English language term for this virus. The French call it Varicelle. The Spanish call the virus Varicela. Only the Germans call Chicken Pox by anything even remotely similar. They call them “Windpocken”. So, back to the topic at hand, why IS it called “Chicken Pox”? Well, there are many theories, as there usually are to “street names” of things. In the 1600s the Englishman, Dr. Richard Morton, misdiagnosed the disease as a milder form of Small Pox. Small Pox, though now eradicated through vaccination, was a fatal disease that killed approximately 300-500 million people during the 20th century alone, and wasn’t any less deadly in Dr. Morton’s time. Because both viruses manifest themselves in the form of lesions on the skin as well as fever, it was easy to see why anyone would connect the two to one another. In fact, the great 18th century Doctor Samuel Johnson himself is credited in one of the most popular theories as to the origin of the name Chicken Pox. This theory goes that he believed since it was a milder form of Small Pox, it wasn’t as strong or as vicious. Therefore, it was “chicken.” If you’re curious, chicken, meaning “coward,” first popped up around the 14th century. 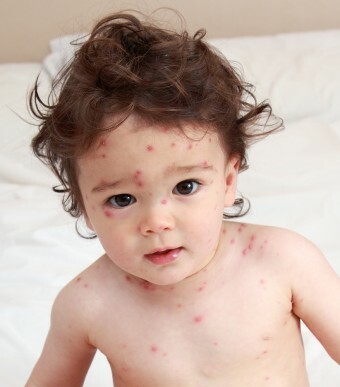 Chicken Pox, a cutaneous disease, frequent in children, wherein the skin is covered with pustules like those of the small pox. In 1767, Dr. William Heberden, also hailing from England, made the discovery that Chicken Pox and Small Pox are in fact, NOT from the same virus as previously thought. Beyond those, people have voiced theories that generally aren’t given as much credence, such as that the red spots look like a chicken pecked the victim. Another idea is that they were named for their similarity in appearance to “chick peas” (a.k.a. “Garbanzo Beans” or “Ceci Beans”). So depending on which of the two main theories you want to believe, Chicken Pox would then either literally be “cowardly/lesser blisters” (as in a lesser form of Small Pox- which if you go look at some pictures of those affected, Chicken Pox is definitely lesser). Alternatively, it could simply be a bastardized way of saying “Icchen (as in itchy) Blisters,” which for those of us who’ve had it, we can all agree Chicken Pox is that. So take your pick. There just isn’t enough documented evidence for us to know for sure on this one. Ever look closely at the flesh of a plucked chicken? along with numerous other online sites by Googling the term. An Arabic traveler wrote that certain Slavic tribes didn’t eat chicken because they said it made them weak and produced a red rash. Could there be a connection?